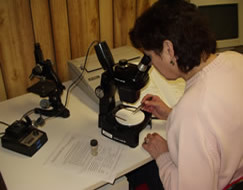 Identifications are made by two full-time urban entomologists, Sandra Kraft and Larry Pinto, with over 50 years of combined experience in urban entomology. Please note that our identification service is limited to urban pests in and around buildings (such as cockroaches, ants, flies, mosquitoes, stored product pests and other food pests, fleas, ticks, bed bugs, stinging insects, fabric pests, termites, and other wood destroying insects). We can also identify many pests of ornamental plants but would recommend that you send such samples to your local cooperative extension service or to other experts in ornamental plants. ALERT: Do not send us specimens taken from the human body. Do not send skin scrapings, samples of hair, or tiny bugs crawling on the skin. Such problems must be addressed by a physician. Insects or other arthropods sent to us for identification must be handled properly and packaged to prevent damage or leaks. Instructions are provided below. All submissions must be accompanied by a completed Insect/Arthropod Identification Form. Click here for a PDF file of the form-- Insect/Arthropod Identification Form. Try and collect a number of specimens of the problem insect or arthropod rather than just one. If more than one stage of development is present (adults, larvae, pupae, or different sized nymphs), collect a series. We use various identification keys and typically some are for adults and some for immatures. Try and collect whole specimens in good shape. It is very difficult to identify insects and arthropods with missing body parts because invariably the missing part...a wing or a part of a leg or antenna...is the key to proper identification. 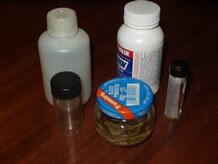 If the pest was damaging wood or infesting a product, include a sample of the material with the pest (but do not place it in the alcohol vial with the specimens). Insects (except butterflies and moths) should be placed in a “leak-proof” (VERY important) screw-top vial or small medicine bottle (able to hold liquid without leaking, even when squeezed) and partially filled with 70% rubbing (isopropyl) alcohol. 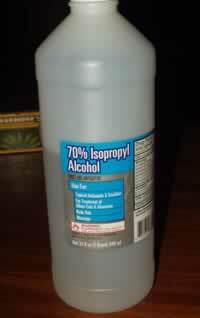 Ethyl alcohol or even vodka are acceptable substitutes. Make sure the top is tight, does not leak at all, and then tape it closed to further prevent leakage. Place the vial in a sealed plastic sandwich bag or other type of container for further protection from leaks. Butterflies or moths should be carefully packed dry in tissue paper. Photos © Pinto & Associates, Inc. Include a completed lower half of the Insect/Arthropod Identification Form, and provide as much descriptive information on it as possible. Often a simple observation about location or feeding damage can be the key to identifying a pest. A photo can be invaluable. Include a hard copy or e-mail us a digital copy. 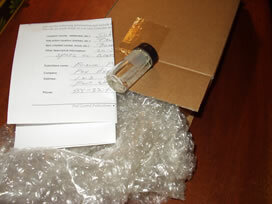 Pack the vial inside a crush-proof box or mailing tube lined with bubble wrap or other cushioning material. DO NOT send the specimens in an envelope. You can ship by whatever method you choose, depending on how soon you need the results.